Kentucky’s position concerning gambling is quite strict, with very few forms of legally approved betting allowed in the state. With a rich culture of equestrian history that includes the Kentucky Derby, the Bluegrass State does have a warm sport in its heart for pari-mutuel wagering on horse races. A state lottery, limited social gambling and charitable gaming are the only other options for state-regulated betting in Kentucky. While state licensed sportsbook gambling is waiting to be approved by state legislatures, this has not detoured Kentuckians from resourcefully locating and participating in legal online sports betting activities. All it takes is some savvy navigation of the legal landscape surrounding sports wagering in Kentucky and you can be well on your way to visiting licensed bookmakers who are legally sanctioned to accept bets from Kentucky residents. This page will take a look at relevant Kentucky gambling laws, how US federal laws play a role in the state’s gambling market and where to find legitimately legal online sports betting opportunities. We offer this guide as solely informational and are not intending for this information to substitute for or serve as professional legal advice or services. The following page answers the question "Is Online Sports Betting Legal In The United States?" The absolutely top choice for us when it comes to US friendly sports betting is BetOnline Sportsbook. They welcome players from Kentucky and offer a few fantastic bonus offers. New players will get a 50% match bonus up to $1,000 for your first deposit. Returning customers receive a 25% match worth up to $1000 on every deposit for as long as you are a customer there. 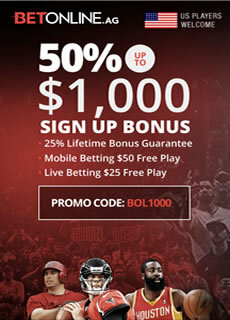 A lifetime bonus offer certainly sets them apart from just about every other sportsbook. Their mobile betting app is well designed and compatible with most service providers and mobile devices. Their live betting features are strong and can be accessed from their website or their mobile app. Their live betting features are available for multiple sports categories. Is Online Sports Betting Legal In Kentucky? Lets qualify this question just a little bit. You are not going to find state licensed online sportsbook gambling anywhere in the United States, including Kentucky. What you will find is legally sanctioned offshore sportsbooks that are regulated outside of the United States and that accept bets from residents of Kentucky and other US states. The reason that state regulated sports betting is off the table is due to the reach of two US federal laws, including the Professional and Amateur Sports Protection Act and the Federal Wire Act. The first one, PASPA, prohibited state based bookmakers from operating in the US with the exception of four specific states: Delaware, Montana, Nevada and Oregon. PASPA reigned supreme from 1992-2018 until it was ruled unconstitutional by the Supreme Court of the United States. Now that PASPA has been repealed, states have the right to enact sports betting laws. Secondly, the Federal Wire Act prohibits state licensed and US licensed online sports betting operations. These two laws combine to ban sports wagering throughout the country with only four limited exclusions. 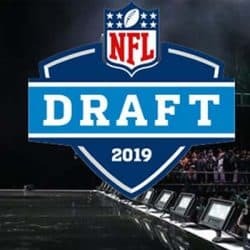 Both of these laws influence sports betting from a provider or operator standpoint, and do not make those placing bets a subject of contention within the laws’ provisions. Placing bets online is not made illegal, but accepting them as a US based business is illegal. There is no mentioned of online gambling in Kentucky ‘s state statutes, hence, it is not legal to own or operate any type of online gambling site within Kentucky. The state does allow the online purchase of lottery tickets, but that is the extent of state regulated online gambling in the Bluegrass State. Neither Kentucky state laws nor the US federal laws governing sports betting in the US make it a crime for residents of the state to engage in online sports betting at offshore bookmakers that are licensed and regulated to operate within the industry. This means that you can visit, open and account and place bets at any of the legally sanctioned sportsbooks listed on this page without violating state or federal laws. 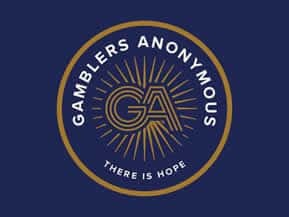 We have personally vetted each brand you see on this page to review them for legitimacy (licensing and regulatory oversight) as well as quality (range of betting lines, wagering options, etc). Is Kentucky Affected by Federal Gambling Restrictions? There are two specific federal laws which have an impact on Kentucky residents. the first one is the Federal Wire Act, which effectively prohibits any type of US-based online sports betting, hence making it illegal for Kentucky to allow a state-regulated sportsbook business. The second law that affects US residents is the UIGEA law. UIGEA is an online gambling related law, but simply places regulatory oversight on gambling-related transactions and doesn't address players at all. Like state laws in Kentucky, these federal laws do not criminalize online sports betting that takes place at sportsbooks that are legally licensed and regulated by a governing jurisdiction that has legalized online gambling for its respective territories. You will not be violating either state or federal laws if you engage in legal, offshore sports betting online. The key to remaining on the legal side of things is to make sure the site at which you are visiting is indeed legally licensed, regulated and holds applicable compliance certifications. The sportsbooks we recommend are all legally sanctioned to operate within the industry. Kentucky might be fairly strict when it comes to their stance on gambling, but the state isn't exactly a barren wasteland bereft of all gambling options. For starters, Kentucky is the home of the largest horse race in history, the Kentucky Derby. Every year this race takes place at Churchill Downs in Kentucky, and it draws people from the richest of the rich to the average working Jane and Joe who flood the field. People wear their fancy hats, drink their mint juleps, and gamble on horse racing. Kentucky knows full well that the overall appeal of the Derby has little to do with the actual horses. It's all about the gambling atmosphere. If it weren't such a huge draw for gamblers, the Kentucky Derby wouldn't be half the race it is today. And Kentucky knows better than to sanction gambling at Churchill Downs. The bulk of their yearly tourism shows up during Derby season. They might be fairly strict against gambling, but they're not stupid. Churchill Downs, located in Louisville, is a prestigious racetrack that also offers rooms for travelers. There are more racetracks throughout Kentucky, including Ellis Park at Henderson, Kentucky Downs in Franklin and Thunder Ridge in Prestonsburg to name a few. Some racetracks offer an electronic game of chance to play, however, based on the ongoing controversy over these machines, this could change at any time. The state of Kentucky happens to share a lot in common with the state of Kansas when it comes to sports. Like Kansas, Kentucky doesn't have any professional sports teams to speak of. There's no NFL franchise in the state, nor is there one planning on making the move there any time soon. They don't have any baseball team either, which is weird because Louisville and baseball are forever joined; e.g. Louisville slugger, the famous baseball bats. And there's no basketball team from the NBA either, but everyone knows that's because there's no NBA team that could compete with the University of Kentucky's basketball program. Yeah, just like Kansas and their Jayhawks, Kentuckians are in love with their Wildcats. Kentucky basketball is a huge hit all over the nation. Kentuckians might be a little selfish with their Wildcats and Louisville Cardinals, but the rest of America was in awe of the team last year as the Wildcats came within one game of going undefeated on the entire season. Their team was made up of nine McDonald's all-American players, and coach John Calipari introduced a unique platoon system, which saw many of Kentucky's players on the court rather than a typical starting-five and backups set-up. This system worked like a charm for the first 38 games of the season. Kentucky earned a number-one seed heading into the tournament, and they steam rolled the competition en route to the Final Four. However, they ran up against a team in Wisconsin that was out for revenge. 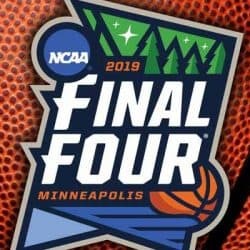 Wisconsin played the best game of their lives and defeated Kentucky in a heartbreaker for Kentuckians, winning the game in the final minutes of the second half. This was a bad time for Kentucky to suffer their only loss of the season, as it would be their last game, but most people still recognized Kentucky as the best team of the basketball season. The good news for Kentucky is that they haven't lost too much talent to the draft. 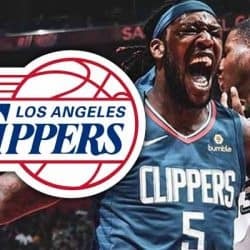 A few players are moving on, some to the NBA and some just past Kentucky, but they're still going to be able to put together a premium product for next season. This is because Calipari's squad was actually made up of a lot of freshmen. In their game against Wisconsin, freshmen scored every second-half point for the team, and the Wildcats were still in contention up until the final seconds. The loss may have really stung, but that any freshman class could play so well is a tremendous sign going forward. The Kentucky Wildcats are a little blessed to play NCAA men's basketball in the SEC. In college football, Kentucky is usually at the bottom of the SEC East, behind teams like the Florida Gators, the Georgia Bulldogs, the Tennessee Volunteers and the South Carolina Gamecocks. But in basketball, none of these schools have a program that can even get close to Kentucky. They rule the roost in the SEC, and they are pretty much a lock next season for a top-seed berth in the March Madness tournament. Of course, anything could potentially go wrong, but taking into account Kentucky's level of talent versus the other teams in their division, Kentucky is a very heavy favorite to win their division and to coast into the tournament. And the good news is that all the pressure is off. It's extremely unlikely that the Wildcats will be looking at another undefeated season, so the idea of perfection isn't going to be important. The kids can simply play basketball during next year's tournament, and the end result could be a lot better than last year.